Hair removal is a HUGE issue in the drag world – ask any queen and they’ll tell you about the continuous challenge of going out on stage with silky legs every show. In this industry, you’re required to have smooth skin five nights a week, so hair removal becomes a real chore. Redness, sensitivity (and not to mention the time and effort wasted) means that shaving has become a real frustration over the past few years. Plus, quick-to-blunt razors mean I’m forever taking a trip down to the shops – and blades are expensive! Drag Queens must be clean shaven to do their job, so hair removal products are vital to our profession. Which is where a device like the Love My Skin hair removal laser comes in. I’d love hairless skin so that I don’t need to shave my body anymore. Which is why I’ve been so excited to get my hands on the Love My Skin laser hair removal system and get going with my treatment. 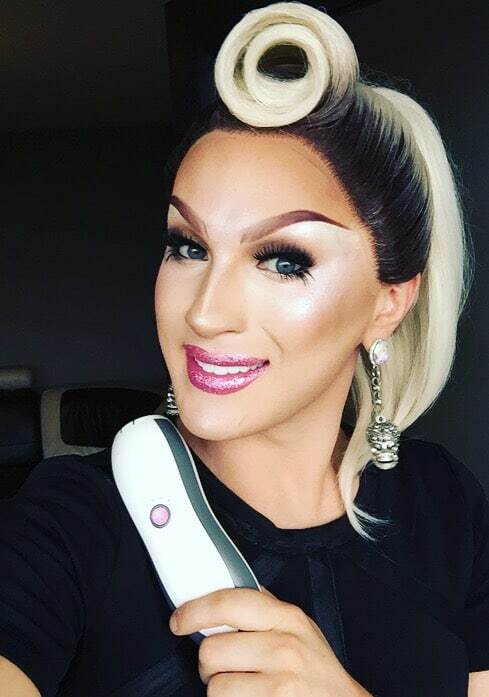 I’ve tried laser treatment before but the expense is hard to maintain, as well as all the trips to the salon when I’m touring around the country. I can carry the Love My Skin laser with me easily wherever I go, which means I’ll never miss a treatment. The laser itself is beautiful – the packaging is amazing and really luxurious, exactly what you’d expect from a high-end beauty device! I’m really enjoying the device itself; it’s smooth and surprisingly light-weight. I’ve had lasering before, so I knew what feeling to expect, but for those of you who haven’t there’s no need to worry: it feels like nothing more than a gentle flick of heat. You can dial up the intensity on one of the five settings (even on the strongest setting the feeling is only that of a tingle) and then it’s ready to go! The laser plugs in so there’s no need to worry about battery life, and nothing to get in the way of your transformation sessions. My beauty regime is normally as simple as putting coconut oil on EVERYTHING, but now the laser can be added to that list – I’m living for smooth skin! My favourite part is how much of breeze and easy-to-use the laser is: I literally put my feet up in front of the TV (watching Ru Paul or the Chase obviously) and zap away! It’s miles easier than having to go to a salon (not to mention a lot cheaper) and, after staying up for a night on the decks, it’s nice to know I can enjoy a nice evening of treatment from the comfort of my couch the next day. The laser can take between 3-6 months to show results but after my second session I have no doubt that this is the right solution for me, and can’t wait to crack on with my third. I’m happy to know that before the end of summer I’ll be rocking completely smooth skin!